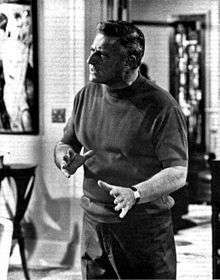 Stanley Earl Kramer (September 29, 1913 – February 19, 2001) was an American film director and producer, responsible for making many of Hollywood's most famous "message films". As an independent producer and director, he brought attention to topical social issues that most studios avoided. Among the subjects covered in his films were racism (in The Defiant Ones and Guess Who's Coming to Dinner), nuclear war (in On the Beach), greed (in It's a Mad, Mad, Mad, Mad World), creationism vs. evolution (in Inherit the Wind) and the causes and effects of fascism (in Judgment at Nuremberg). His other notable films included High Noon (1952, as producer), The Caine Mutiny (1954, as producer), and Ship of Fools (1965). Director Steven Spielberg described him as an "incredibly talented visionary", and "one of our great filmmakers, not just for the art and passion he put on screen, but for the impact he has made on the conscience of the world." Kramer was recognized for his fierce independence as a producer-director, with author Victor Navasky writing that "among the independents . . . none seemed more vocal, more liberal, more pugnacious than young Stanley Kramer." His friend, Kevin Spacey, during his acceptance speech at the 2015 Golden Globes, honored Kramer's work, calling him "one of the great filmmakers of all time." Despite uneven critical reception, both then and now, Kramer's collected body of films receives many awards, including 16 Academy Awards and 80 nominations, and he was nominated nine times as either producer or director. In 1961, he received the Irving G. Thalberg Memorial Award. In 1963, he was a member of the jury at the 3rd Moscow International Film Festival. In 1998, he was awarded the first NAACP Vanguard Award "in recognition of the strong social themes that ran through his body of work." In 2002, the Stanley Kramer Award was created, to be given to recipients for work that "dramatically illustrates provocative social issues." Stanley Kramer was born in Manhattan, New York, in a neighborhood known as Hell's Kitchen due to its reputation as a tough, gang-ridden area. His parents were Jewish, and having separated when he was very young, he remembered little about his father. :102 His mother worked at a New York office of Paramount Pictures, during which time his grandparents took care of him at home. :23 His uncle, Earl Kramer, worked in distribution at Universal Pictures. Kramer attended DeWitt Clinton High School in The Bronx, where he graduated at age fifteen. He then enrolled in New York University where he became a member of the Pi Lambda Phi fraternity and wrote a weekly column for the Medley newspaper. He graduated in 1933 at the age of nineteen with a degree in business administration. After developing a "zest for writing" with the newspaper, notes biographer Donald Spoto, he was offered a paid internship in the writing department of 20th Century Fox and moved to Hollywood. :23 Until receiving that writing job, he had planned to enroll in law school. Over the following years, during the period of the Great Depression, he took odd jobs in the film industry: He worked as a set furniture mover and film cutter at MGM, writer and researcher for Columbia Pictures, writer for Republic Pictures, and associate producer with Loew-Lewin productions. These years of work as an apprentice in Hollywood, as writer and editor, helped him acquire an "exceptional aptitude" in editing and overall film structure which, according to some critics, enabled him to later edit his own films "in the camera," with minimal wastage. He was drafted into the Army in 1943, during World War II, where he helped make training films with the Signal Corps in New York, along with other Hollywood filmmakers including Frank Capra and Anatole Litvak. He left the army with the rank of first lieutenant. The whole surge of independent production came about because the major film companies, the studios, were shocked by the onrush of television. Kramer's new company was able to take advantage of unused production facilities by renting time, allowing him to create independent films for a fraction of the cost the larger studios had required, and he did so without studio control. Kramer also saw this as an opportunity to produce films dealing with subjects the studios previously avoided, especially those about controversial topics. Instead of relying on star names, we pinned our faith in stories that had something to say. If it happened to be something that other movies hadn't said before, so much the better. The only basis of choice was personal taste. The first movie produced under his production company was the comedy, So This Is New York (1948), directed by Richard Fleischer, and based on Ring Lardner's The Big Town. It failed at the box office. It was followed with Champion (1949), another Lardner story, this one about an ambitious and unscrupulous boxer. Scripted by Foreman, it was tailored to fit the talents of Kirk Douglas, an ex-wrestler who had recently become an actor. Filmed in only twenty-three days with a relatively small budget, it became an immense box-office success. It won an Academy Award for Best Editing, with four other nominations, including Douglas for best actor and Foreman as screenwriter. Kramer next produced Home of the Brave (also 1949), again directed by Mark Robson, which became an even bigger success than Champion. The story was adapted from a play by Arthur Laurents, originally about anti-Semitism in the army, but revised and made into a film about the persecution of a black soldier. Byman notes that it was the "first sound film about antiblack racism." The subject matter was so sensitive at the time, that Kramer shot the film in "total secrecy" to avoid protests by various organizations. Critics generally liked the film, which, notes Nora Sayre, "had a flavoring of courage." His renamed Stanley Kramer Company produced The Men (1950), which featured Marlon Brando's screen debut, in a drama about paraplegic war veterans. It was the first time Kramer and Foreman worked with director Fred Zinnemann, who had already been directing for twenty years and winning an Oscar. The film was another success for Kramer who took on a unique subject dealing with a world few knew about. Critic Bosley Crowther noted that its "striking and authentic documentary quality has been imported to the whole film in every detail, attitude and word." They struck me as being enormously efficient. Kramer was very inventive in finding quite unlikely sources of finance . . . This method of outside financing . . . was truly original and far ahead of its time. . . There were no luxurious offices, no major-studio bureaucracy, no small internal empires to be dealt with, no waste of time or effort. . . I was enthusiastic about this independent setup and the energy it created. Also released in 1950 was Kramer's production of Cyrano de Bergerac, the first English language film version of Edmond Rostand's 1897 French play. It made a star of José Ferrer, who won his only Oscar for Best Actor. In 1951, Columbia Pictures president Harry Cohn offered Kramer's company an opportunity to form a production unit working with his studio. Kramer was given free rein over what films he chose to make, along with a budget of nearly a million dollars each. Kramer agreed to a five-year contract during which time he would produce twenty films. :116 However, Kramer would later state that the agreement was "one of the most dangerous and foolhardy moves of my entire career." He agreed to the commitment because of his "deep-seated desire to direct," he states, along with the security of ready studio financing. He finished his last independent production, High Noon (1952), a Western drama directed by Fred Zinnemann. The movie was well received, winning four Oscars, as well as three nominations. Unfortunately, High Noon's production and release intersected with the Red Scare. Writer, producer and partner Carl Foreman was called before the House Un-American Activities Committee while he was writing the film. Foreman had been a member of the Communist Party ten years earlier, but declined to "name names" and was branded an "un-cooperative witness" by HUAC,and then blacklisted by the Hollywood companies, after which he sold his interest in the company. Kramer continued producing movies at Columbia, including Death of a Salesman (1951), The Sniper (1952), The Member of the Wedding (1952), The Juggler (1953), The Wild One (1953) and The 5,000 Fingers of Dr. T (1953). With a larger budget, his films took on a "glossier" more polished look, yet his next ten films all lost money, although some were nonetheless highly praised. In 1953 Cohn and Kramer agreed to terminate the five-year, 20-film contract Kramer had signed. However, his last Columbia film, The Caine Mutiny (1954), regained all of the losses Columbia had incurred as a result of his earlier projects. The Caine Mutiny, was an adaptation of the book written by Herman Wouk and was directed by Edward Dmytryk. Kramer noted that during the 1940s and 1950s, "cinema was the producer's medium:"
After The Caine Mutiny, Kramer left Columbia and resumed his independent productions, this time in the role of the director. Over the next two decades, Kramer reestablished his reputation within the film industry by directing a continual series of often successful films dealing with social and controversial issues, such as racism, nuclear war, greed and the causes and effects of fascism. Critic Charles Champlin would later describe Kramer as "a guy who fought some hard battles. He took on social issues when it was not popular to do so in Hollywood." Among some of those controversial films were Not as a Stranger (1955), The Pride and the Passion (1957), The Defiant Ones (1958), On the Beach (1959), Inherit the Wind (1960), Judgment at Nuremberg (1961), and Guess Who's Coming to Dinner (1967). Besides dramas, he also directed It's a Mad, Mad, Mad, Mad World (1963) with an all-star cast of famous comedians. His films often generated interest and other times failed, such as Bless the Beasts and Children (1971), Oklahoma Crude (1973), The Domino Principle (1977), and The Runner Stumbles (1979). His first film as director was Not as a Stranger (1955), the story of medical students and their career, some of whom lose their idealism and succumb to blind ambition, adultery, and immoral behavior. The film was a "smash hit," although reviews were mixed. Pauline Kael claimed it "lacked rhythm and development." The Pride and the Passion (1957) is an adaptation from The Gun, a novel by C. S. Forester. It portrays in detail how a dedicated group of Spanish guerrillas dragged a gigantic cannon across half the country in an effort to defeat Napoleon's advancing army. It stars Frank Sinatra, Cary Grant and Sophia Loren. The following year, Kramer directed The Defiant Ones (1958), the story of two escaped convicts in the Deep South, one black, played by Sidney Poitier, and one white, Tony Curtis. To add to the intensity of the drama, both men are shackled together with chains, forcing them, despite their wishes, into a sense of brotherhood, suffering and fear. New York Times film critic Bosley Crowther lauded the production and the acting in the film, calling it "a remarkably apt and dramatic visualization of a social idea—the idea of men of different races brought together to face misfortune in a bond of brotherhood — is achieved by producer Stanley Kramer in his new film." It was nominated for eight Academy Awards, winning two. The screening was one of the most emotional I have experienced. After the film, the crowd stood—many with tears in their eyes—and gave Poitier and Kramer an ovation that subsided only when we had left the auditorium. Stanley's visit to Moscow marked the high point in the cultural exchange between the two countries during those long years of estrangement. With his next film, On the Beach (1959), Kramer tried to tackle the sensitive subject of nuclear war. The film takes place after World War III has annihilated most of the Northern hemisphere, with radioactive dust on a trajectory towards Australia. Kramer gave the film an "effective and eerie" documentary look at depopulated cities. It starred Gregory Peck, Ava Gardner, Fred Astaire and Anthony Perkins. It may be that some years from now we can look back and say that On the Beach is the movie that saved the world." Critics Arthur Knight and Hollis Alpert likewise praised the film and admired Kramer for showing "courage in attempting such a theme." Inherit the Wind (1960) became Kramer's next challenging film, this one taking on the highly charged subjects of creationism and evolution, and how they are taught in school. The film, an adaptation of the play of the same name, written by Jerome Lawrence and Robert Edwin Lee, was a fictionalized account of the 1925 Scopes Trial, which made it unlawful to teach evolution in any state-funded school in Tennessee. It starred Spencer Tracy, portraying the real Clarence Darrow defending the teacher, and Fredric March as his rival attorney, portraying William Jennings Bryan who insisted that creationism was the only valid subject that should be taught to children. It was nominated for four Academy Awards. Stanley Kramer has once again used film importantly and continues to emerge as the only truly responsible moviemaker in Hollywood." Similarly, Arthur Knight credited Kramer for the film's significance: "from first to last, the director is in command of his material. . . . he has not only added hugely to his stature as a producer-director, but to the stature of the American film as well." [Mayor] Willy Brandt stood up and warned the audience that they might not find the film pleasant, but that if Berlin was ever to regard itself as a capital city, then this film should be shown there because it was about all of them. "We may like or dislike or disagree with many things," he said, "but here it is." These films had not yet been released to the public; very few people had seen them. We didn't know what to expect. . . We watched scenes of bulldozers shoving piles of bodies into mass graves. We saw survivors, their eyes bulging, their bones practically protruding from their bodies. We saw the crematoriums and the piles of shoes. People gasped in shock, others started crying. Certainly it was the most horrifying thing I had ever seen in my life . . . But from that night on we understood the importance of the film we were making. After the seriousness of his previous films, Kramer "felt compelled to answer" for the "lack of lightness" in his earlier films, writes Spoto. As a result, he directed It's a Mad, Mad, Mad, Mad World (1963), a film with a "gifted, wacky crew of comedians. ":257 Kramer describes it as a "comedy about greed. ":257 According to one writer, he directed it "to prove he could also handle comedy" and hired many of the leading comedic actors of the previous decades, from silent star Buster Keaton to emerging talent Jonathan Winters. Winters would later write that "Kramer was a man who took chances—as they say, he worked without a net." It played to mixed reviews with some criticizing its excessive comedy with too many comedians thereby losing its focus. Nonetheless, it was Kramer's biggest box office hit, and the public enjoyed its "socially disruptive and goofy" story and acting. Film critic Dwight Macdonald writes that its "small army of actors—105 speaking roles—inflict mayhem on each other with cars, planes, explosives and other other devices . . . is simply too much for the human eye and ear to respond to, let alone the funny bone," calling it "hard-core slapstick." It was nominated for six Academy Awards, winning for Best Sound Editing. Ship of Fools (1965) has been described as a "floating Grand Hotel," an earlier film which also had an all-star cast. Its story is about personal relationships among passengers, rather than any clear plot. It takes place on board a passenger liner returning to Germany in 1933, during the rise of Nazism. Spoto describes its theme as one of "conscious social and psychological significance. ":266 It won two Academy Awards and was nominated for six others. For his fourth film about the sensitive subject of anti-racism, he both directed and produced Guess Who's Coming to Dinner (1967), a groundbreaking story about interracial marriage. It starred Spencer Tracy, Sidney Poitier, and Katharine Hepburn, winning two Academy Awards with eight nominations. It has been listed in the top 100 films over the last 100 years by the American Film Institute. However, despite its popularity with the public and its box-office success, many critics gave it negative reviews. The film was Kramer's last major success, and his subsequent films were not profitable, although many had mixed reviews. Among those films were The Secret of Santa Vittoria (1968), R. P. M. (1970), Bless the Beasts and Children (1971), Oklahoma Crude (1973), The Domino Principle (1977), and The Runner Stumbles (1979). Oklahoma Crude was entered into the 8th Moscow International Film Festival where Kramer won the Golden Prize for Direction. At the time of his retirement, he was attempting to bring a script entitled "Three Solitary Drinkers" to the screen, a film about a trio of alcoholics that he hoped would be played by Sidney Poitier, Jack Lemmon, and Walter Matthau. In the 1980s, Kramer retired to Bellevue, Washington and wrote a column on movies for the Seattle Times from 1980-1996. During this time, he hosted his own weekly movie show on then-independent television station KCPQ. In 1997, Kramer published his autobiography, A Mad Mad Mad Mad World: A Life in Hollywood. He died on February 19, 2001 in Los Angeles, aged 87, after contracting pneumonia. He was married three times and divorced twice. He was survived by his third wife, Karen, and four children: Casey and Larry (with Anne Pearce), and Katharine and Jennifer (with Karen Sharpe). Kramer has been called "a genuine original" as a filmmaker. He made movies that he believed in, and "straddled the fence between art and commerce for more than 30 years." Most of his films were noted for engaging the audience with political and social issues of the time. When asked why he gravitated to those kinds of themes, he stated, "emotionally I am drawn to these subjects," and thought that independent productions like his might help "return vitality to the motion picture industry. . . . If our industry is to flourish, we must break away from formula thinking." Film author Bill Nichols states that "Kramer's films continue a long-standing Hollywood tradition of marrying topical issues to dramatic form, a tradition in which we find many of Hollywood's more openly progressive films." Among his themes, Kramer was one of the few filmmakers to delve into subjects relating to civil rights, and according to his wife, Karen Kramer, "put his reputation and finances on the line to present subject matter that meant something." He gave up his salary to make sure that Guess Who's Coming to Dinner would be completed. He has not though been universally admired. Film critic David Thomson has written that Kramer's "films are middlebrow and overemphatic; at worst, they are among then most tedious and dispiriting productions the American cinema has to offer. Commercialism, of the most crass and confusing kind ... devitalised all [of] his projects." In the 1960s Kramer blamed the growing "youth culture" with having changed the "artistic landscape" as he remembered it from his own youth. "No longer," he said, "were writers or filmmakers interested in creating the Great American Novel or the great American film, or indeed with exploring what it meant to be American." Kramer produced and directed 23 different actors in Oscar-nominated performances, with José Ferrer, Gary Cooper, Maximilian Schell and Katharine Hepburn winning for their performances. Kramer's was among the first stars to be completed on the Hollywood Walk of Fame on March 28, 1960, out of the original 1,550 stars created and installed as a unit in 1960. One of his daughters, Kat Kramer, is co-producer of socially-relevant documentaries, part of her series, Films That Change The World. ↑ Membership Directory, 2010, Pi Lambda Phi Inc.
1 2 Harris, Mark (2008). Pictures at a Revolution: Five Movies and the Birth of the New Hollywood. Penguin Press. ISBN 978-0143115038. ↑ "8th Moscow International Film Festival (1973)". MIFF. Retrieved 2013-01-03. ↑ "Director Stanley Kramer dies". The Seattle Times. February 20, 2001. ↑ Lyman, Rick (21 February 2001). "Stanley Kramer, Filmmaker With Social Bent, Dies at 87". New York Times. Retrieved 5 May 2016. ↑ History of WOF hollywoodchamber.net; Hollywood Chamber of Commerce. Retrieved 2010-05-31. ↑ "Kramer First Name Put in Walk of Fame"(abstract). Los Angeles Times, March 29, 1960, p. 15. Full article: LA Times Archives Retrieved 2010-06-12. Wikimedia Commons has media related to Stanley Kramer. "The Godfather of Independent Film" on YouTube, video, 3.5 min.